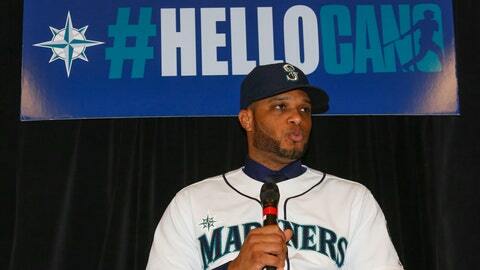 Cano officially a Mariner — but what on earth is he talking about? It’s difficult to question a guy’s career choice after he signs a 10-year, $240 million contract. But Robinson Cano finally spoke about his decision to join the Mariners, and it’s a safe bet he could have made a killing as an accountant or a politician. And after ESPN aired an interview with the second baseman Thursday, much of the baseball world was still scratching its head well into Friday. Multiple reports have stated the offer the Yankees made in an effort to keep their second baseman was seven years, $175 million, and in the interview he did confirm the annual amount of their offer. Then he said he took less money to sign with the Mariners. "If it was about money, I would have asked for more. . . . Let me tell you one thing. I took less money [in Seattle]. The Yankees were offering me 25 [million annually], I took here 24." Cano also said he wanted a contract that would take him through to his retirement. Now, Cano turned 31 in October. Had the Yankees made the playoffs in the final year of their offer, their deal would have had him playing in pinstripes until he was 38. But again, Cano turned down that offer because he wanted a contract that would carry him into retirement. Let’s see what those Mariners fans think of their 40-year-old star in the final year of the deal. Details of Cano’s negotiations with the Yankees and the Mariners did not get much publicity, and most of the Yankees’ comments about Cano have focused on the fact that they were outbid by Seattle; that New York was unwilling to go beyond seven years and jeopardize its efforts to stay within a budget. Yet Cano’s biggest complaint about his former employer? The disrespect New York showed him, of course. What was this disrespect exactly? "I don’t want to go into details," Cano said. Here is the full interview. Enjoy . . . if you can make sense of it. A lot of people are saying that I’m greedy. I’m not greedy. I just was looking for a contract that I can finish my career. You know how this game has been lately. You play until you’re 35, 36, 37, and you don’t have any contract. I didn’t get any respect from the Yankees. The way I got treated through the process, I didn’t like it.